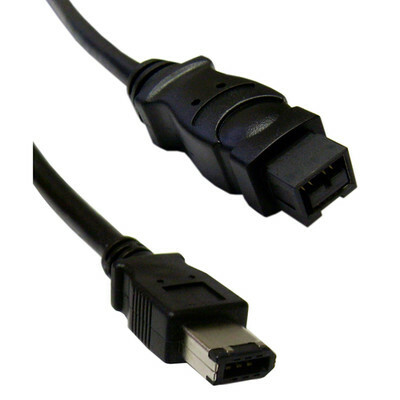 CableWholesale's 6-foot black FireWire 400 (IEEE-1394a) cable connects a FireWire 9-pin (IEEE-1394) male plug to a FireWire 6-pin (IEEE-1394) male plug to ensure super-fast data transfer between digital cameras, external hard drives, and other electronic devices to computers, laptops or other FireWire compatible devices. Gold flash contacts on each end will allow the connection to exceed your expectations and minimizes the chance for corrosion. The 30 AWG shielded cable (AL/Mylar) delivers excellent conductivity transfers with low resistance. Daisy chain up to 63 supported devices on a single FireWire port (providing the devices support daisy chaining). A higher quality cable than I expected at this price.